My twins turn 12 tomorrow. I can’t believe it, TWELVE. How did this happen? I have been making a lot of desserts lately for the celebrations…and I am not even close to being done. Don’t get me started on the 20-some pies I make for Thanksgiving next week! Josie had a sleepover with her friends last Friday and when I asked her what she wanted for her “cake” she thought for a moment and said, what if we make an ice cream cake that ‘s like a cheesecake? 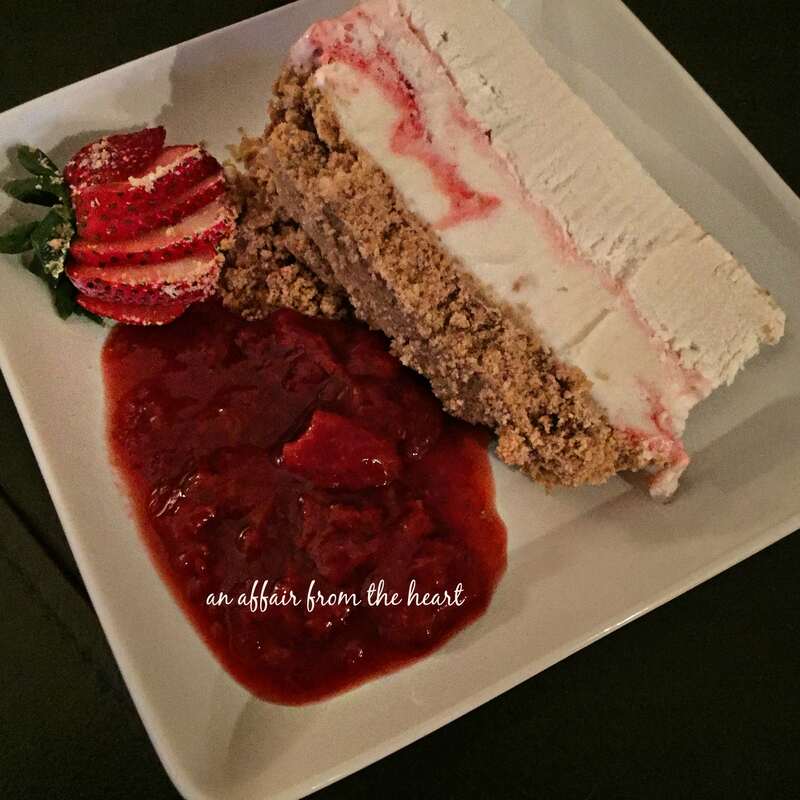 In her mind this Strawberry Cheesecake Ice Cream Torte was born. I am giving her full credit for this idea, and boy, was it a dandy! This is going on the will make again list FOR SURE. Josie has a knack for things like this, though, did you see her guest post on my blog a couple of weeks ago? (Josie’s Red Velvet Truffles) She’s very talented in the kitchen for a girl her age! 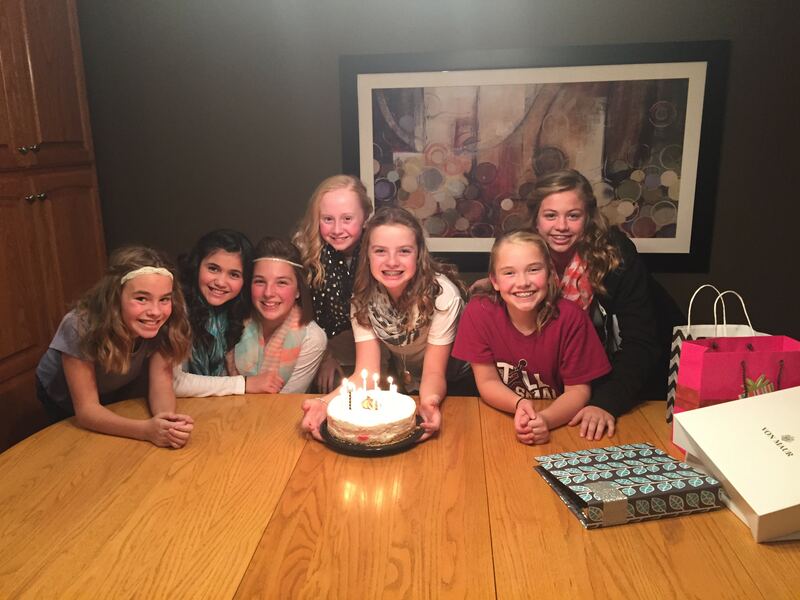 Here is a photo of her and her friends! I made a strawberry sauce to top the torte with, and it was yummy, too bad the photo turned out so cruddy and didn’t do it justice. For her actual birthday, she has requested French Silk Pie, her twin brother, Peanut Butter Cup Ice Cream Cake. Stay tuned for what his buddies are having this Friday night at his sleepover! A refreshing twist on Strawberry Cheesecake. 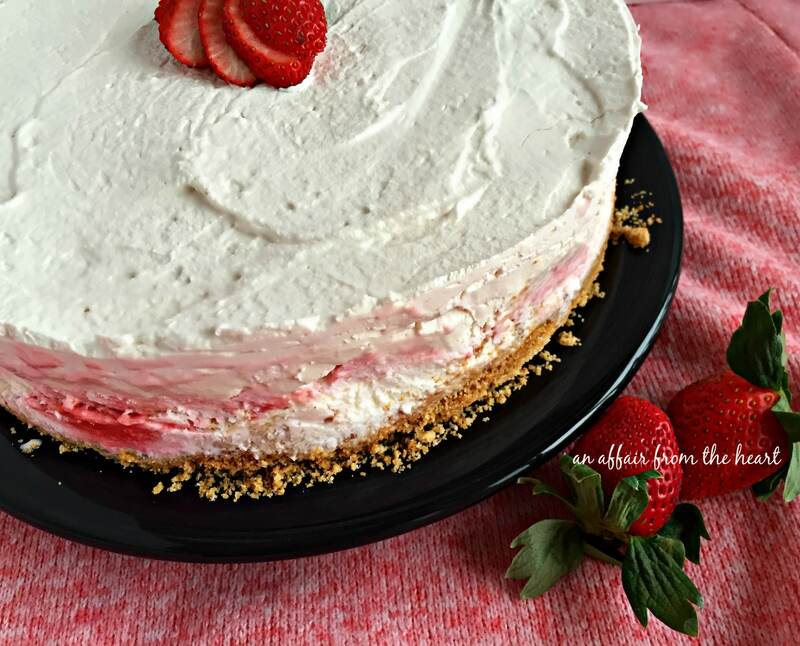 Strawberry Cheesecake ice cream and a Graham Cracker crust. For the Crust: Line the bottom of a spring form pan with non stick foil. Preheat oven to 425 degrees. Combine crust ingredients and press into the bottom of the pan. Bake for 5 minutes. Cool. For the middle: Allow ice cream to soften and scoop into the pan spreading over the top of the crust. Freeze for a few hours. Prepare the whipped cream by placing cream, powdered sugar and vanilla in your mixer, and with the whisk attachment, whip together until cream thickens and forms peaks. Spread over frozen ice cream and return to freezer. For the Sauce: in a saucepan over medium heat, stir together strawberries, sugar and vanilla, Continue heating ans stirring occasionally for about 15-20 minutes, sauce will begin to thicken. Place in the refrigerator and chill until ready to serve. Will continue to thicken. To serve, top with fresh strawberries for garnish, slice and serve with strawberry sauce. This sounds like the perfect dessert!